Hand carved of solid oak in Holland about 1820, this smoking pipe and tobacco or silver cabinet was also called a chimney cupboard because it was narrow and fit in a niche next to a chimney. The old finish is very well preserved with warm antique patina. Waxed and buffed, all that is needed to maintain its luster is an occasional wipe with a soft dry cloth. Columns have old paint. 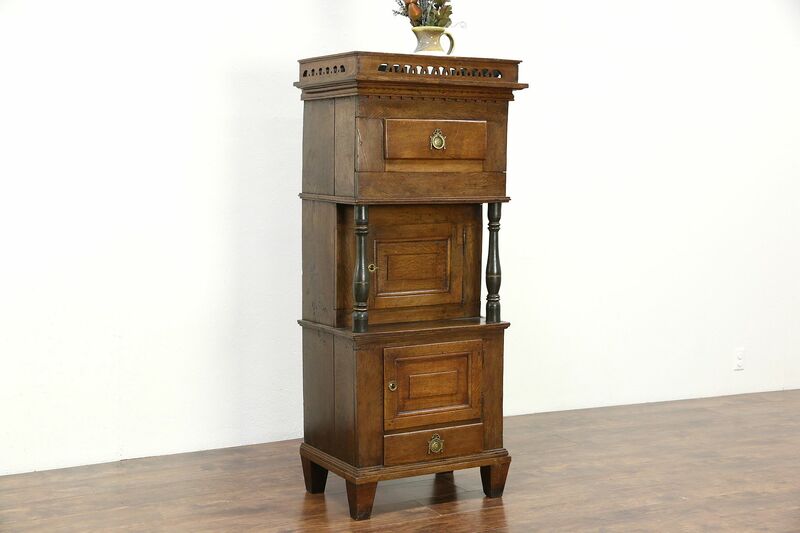 Hand planing marks, cut square nails and shrinkage separations from age are authentic on this Dutch antique furniture. There are various restorations over the centuries, see photos. Locks and key work, brass mounts appear original. Measurements are 26 1/2" wide, 17" deep and 61" tall.